Santa Fe, New Mexico, established in 1607, is the second oldest city founded by European colonists in the United States. Only St. Augustine, Florida is older. It’s long history of Indians, Spanish, Mexicans, and pioneers have led the city to be one of the most haunted in America. 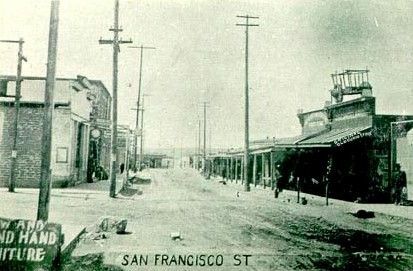 Furthermore, the city was built over an abandoned Tanoan Indian village where no doubt, Indian burial grounds might be found beneath the city’s depths. Santa Fe is one of the few cities that offers a full schedule of “ghost tours” and “ghost walks” year around, with as many as five operators conducting tours from Santa Fe’s historic plaza. These tours primarily focus on the ten block historic area of Santa Fe, featuring such places as the La Posada and La Fonda Hotels, the Grant Corner Inn, Palace of Governors, the oldest house in the nation, and other historic buildings. Some tours also include area superstitions, as well as Santa Fe’s history of vigilantes, gunfights, murders, and hangings. Whether you take a tour or stumble upon its many ghosts on your own, here are a few of Santa Fe’s ghostly legends. Alto Street – Reportedly a headless horseman haunts this street, riding his horse down to the Santa Fe River. Brandishing a sword, it is said that he lost his head to two Spanish witches, after complaining about a love potion they gave him. Most often this headless cowboy is sighted near the riverbank. Casa Real Health Care Center – At this senior health-care facility at 501 Galisteo Street, employees, patients, and visitors have complained of strange happenings ever since the facility was built in 1985. Constructed over the site of an old penitentiary graveyard next to another haunted building, most people say that an oppressive, uncomfortable feeling emanates from this building. Others have reported strange colds spots moving throughout the rooms and unexplained moaning is often heard in the north and south wings. Grant Corner Inn – Just a few steps off Santa Fe’s historic Plaza sits the historic Grant Corner Inn. The house was originally built in 1905 by a couple new to the Santa Fe area. Unfortunately for the young couple, shortly after they built their new home, a sickly son was born who required constant attention. To make matters worse, the woman’s husband died shortly thereafter. The young mother soon remarried a man who was said to have not been a very nice person. Over the years, the child continued to get worse and the mother threw herself into caring for the young boy. During this time, visitors to the home would often report hearing the young boy crying and banging on the walls of his upstairs room while his mother was downstairs visiting. Confined to a wheelchair, the boy was said to have continually rolled too close to the stairway, tumbling down, wheelchair and all, to the landing below. The child finally died of his ailments and the woman and her husband moved away. Afterward, when the house was empty, neighbors would often report seeing lights in the upstairs room that had belonged to the boy. When someone finally purchased the house, the new owners reported hearing noises in the child’s room, as if he was still there. Today the house has been converted into a Bed and Breakfast. When Art Garcia, a former caretaker for the B&B, was interviewed by Antonio Garcez for his book Adobe Angels: Ghosts of Santa Fe and Taos, the caretaker relayed terrifying happenings within the home. In this account, Garcia tells of deafening noises, blasts of freezing air that would often kill house plants, and the terrible aroma of rotting meat. However, since the property was purchased by Louise Stewart, the building has been extensively remodeled and the spirit of the boy has quieted down or perhaps left the building entirely. However, rumors persist that objects continue to fall to the floor, while footsteps and slamming doors are often heard within the old house. Others have reported seeing a grayish figure in the hallway. Reportedly, rooms 4 and 8, as well as the hallway upstairs are the areas reported to be haunted. 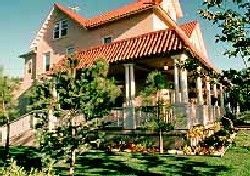 Today, this lovely Bed and Breakfast, voted the best in Santa Fe by several local periodicals, is a charming 10-room Inn, surrounded by a white picket fence and weeping willows. The Inn provides old-fashioned hospitality, comfortable, well-appointed accommodations and innovative country cuisine. Rooms are decorated with antique quilts, brass and four-poster beds, hand-painted armoires and numerous pieces of antiques and art that combine to make each room a unique experience. Luguna Pueblo Mission – The coffin of the murdered priest keeps popping up through the church floor here. 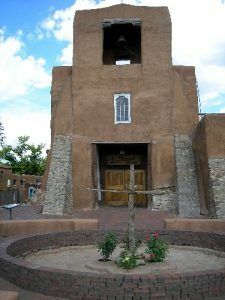 Father Juan Padilla was murdered by Indians in 1733 and was buried beneath the floor at the Islata Pueblo Church. Before long, his coffin, hollowed out of a cottonwood tree, rose out of the earth in front of the altar. It rose again twenty years later, and again in 1889. Then, on Christmas Eve 1914, it poked through the floor again. Two investigations were conducted by the Bishop of Santa Fe, but no conclusion was reached as to the nature of the phenomenon. La Residencia – Now housing a nursing home, this building at the corner of Palace Avenue and Paseo de Peralia, was once the community hospital. Years ago a little boy died in room 311 from injuries suffered in an automobile accident. Unfortunately, the boy’s father also died in the same car wreck. Today the muffled crying of the little boy is heard so often that administrators try to keep the room unoccupied. Other paranormal occurrences also happen in the basement. This only began to occur when the state museum began to utilize the basement to store Indian artifacts. Reportedly, strange sounds are often heard in the basement rooms, so often that some nurses refused to enter the area. On one occasion, two nurses reported seeing a wall in the basement oozing fresh blood. La Residencia is located at 820 Paseo De Peralta. Mission of San Miguel – The oldest church still in use in the United States, this simple earth-hue adobe structure was built around 1610 by the Tlaxcalan Indians of Mexico, who came to New Mexico as servants of the Spanish. Though badly damaged in the 1680 Pueblo Revolt, the sturdy adobe walls remained unharmed. Stone buttresses later were added to strengthen the walls, the tower was remodeled and a modern façade was added. On display in the chapel are priceless statues and paintings and the San José Bell, weighing nearly 800 pounds, which is believed to have been cast in Spain in 1356. The bell was used in churches in Spain and Mexico before being brought to Santa Fe by oxcart in the early 19th century. This old bell is said to have been the source of a miracle in the mid-1800’s when a blind man attended the church at around noon every day. His fervent prayers are said to have caused the bell to ring of its own accord and when it rang, the man regained his sight. Unfortunately, when the ringing stopped, he lost his sight again but was later able to accurately describe statues and icons inside the church. The gift shop at the church, that once served as a private residence is reportedly haunted by a small child who died there in the 1940s. Across the narrow street from the church is the oldest house in the United States, which is supposedly haunted by a malevolent presence. In fact, the entire block surrounding San Miguel dates back to the 1200s and was once the site of an ancient Indian Pueblo. For centuries, tragic and violent events have occurred within this block including the subjugation of the Pueblo Indians, the Pueblo Revolt against the Spanish in 1680, executions of convicted criminals and much more. Not only is the church and the oldest house said to be home to a ghost or two, but the entire block. The church is located at 401 Old Santa Fe Trail.